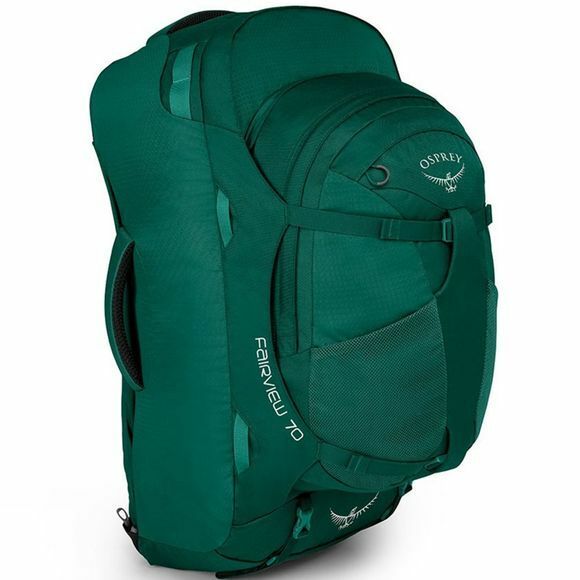 The Women's Fairview Travel Pack from Osprey is a handy, back-packable travel pack with excellent capacity. It features a zip-away spacer mesh ventilated backpanel allowing it to be carried like a backpack but packed like a suitcase. Cushioned grab handles on the top and the sides allow you to easily grab the pack off airport baggage carousels and your gear is all readily to hand, with the inclusion of a large zipped, lockable, opening that allows access to the main compartment. The compression system pulls the load in, holding it tight and keeping things in place, but it can also be used to significantly reduce the total volume of the pack. The compression straps, along with a zip, are also used to attach and secure a 13L daypack, which includes all the organisation, you'll ever need; a top stash pocket for electronics and sunglasses, dual side pockets and a laptop sleeve. 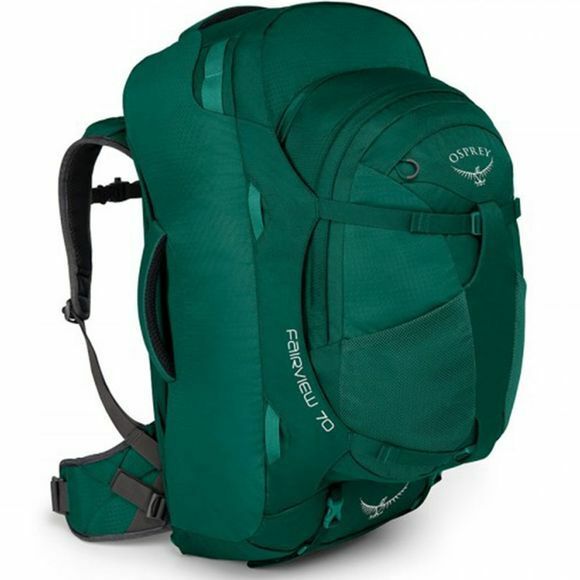 The daypack can also clip onto the harness of the main pack, in a kangaroo style attachment. Providing a very secure way to carry your daypack when you want to keep your valuables or tickets to hand. Inside the main cargo bag there are also organisation options; a liquid/accessory pocket and dual mesh pockets which are ideal to store smaller items. Internal compression straps fully maximise the capacity whilst securing your gear. For overnight trips attach a sleeping pad to the lower external straps. Travel is about companionship, discovery and enjoyment - share your next adventure with your Fairview.